Woke up 3am, had cereal and coffee for breakfast, took a shower and then geared up for the Rexona Run, my 5th race for the year. 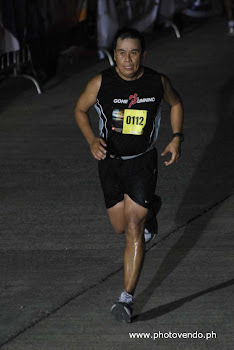 Was excited to run this race since it was a new venue – Mall of Asia (MOA). Left the house with Kay at 4:00am and was expecting to be at race site by 4:30 am to have more time to prepare and meet the rest of Gone Running Club runners. Unfortunately, there was traffic that early at SLEX up north coming from Sta. Rosa Laguna and it caused me to be late at gun start by 19 minutes. This is the first time that I missed the gun start. Good thing I was able to take off before the start of the 5k group. There were a sea of runners and I kept on running trying to chase the flock of 21k runners. When I finally saw some yellow race bib, I just maintained my steady pace and tried to pass as many runners as I can. I had a steady pace until 15th km but started to slow down a bit from then on. I was planning to hit sub 2 hrs, but unfortunately, Im not getting it in this race. I finished officially at 2:11:27 (chip time). I was happy on the result and I did enjoy the run. It was a good race, I think the organizers did a good job. with Raymund and Jay discussing what race to join next. With Allen completing his first half marathon. This guy is determined and have loved the sport of running. Way to go Allen! Run Against Corruption - with Neo Chavez who ran 3km contemplating on when he will level up to 5km! Congratulations to your group ! i was wondering when you would put the rexona run in your blog. Thanks again Chief! Good thing I found time to write about rexona run. Surely I would adjust in the next race. Agree, better early than late. Hope to catch you at the finish line in the next race so that the group can have a photo with you. Thanks Rhods! same to you.. see you in the next race.